Humans today eat gorillas and chimpanzees, so why would our prehistoric ancestors flinch at sitting down to a nicely roasted Neanderthal? That's the shocking new hypothesis being raised by anthropologists in Spain who wonder if our closest extinct relative was exterminated in the same way as 178 other large mammals, so called megafauna, which are suspected of going at least partially by the hand of hungry human hunters. "Except in its native Africa, in the other continents Homo sapiens can be considered as an invasive alien species," write researchers Policarp Hortolà and Bienvenido Martínez-Navarro of the Universitat Rovira i Virgili in Tarragona, Spain. They published their hypothesis in the May issue of the journal Quaternary International. Today there are endless cases of invasive species decimating native species all over the world. So perhaps at the end of the Pliestocene, it was the same when humans spread into Europe and Asia where Homo neanderthalensis was just another big, slow-reproducing mammal. 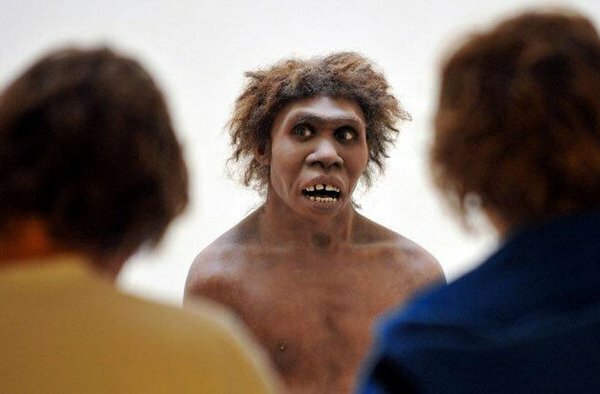 "We think that modern humans, who occupied (a) similar ecological niche as Neanderthals, but with more evolved technology, in their colonization of the new European territories directly competed with Neanderthals for the food and other natural resources," writes Martínez-Navarro, in an emailed response to Discovery News. There are other examples of very similar species overlapping and eventually one of them getting pushed out, explained Martínez-Navarro, especially involving carnivores out of Africa. The African species of saber toothed tiger, for example, spread into Eurasia around 1.8 million years ago and lead to the demise of a very closely related species there. And the arrival of the African spotted hyena into Eurasia matches the extinction of the giant short facet hyena about 800,000 years ago. Of course, this is only suggestive, and not hard evidence that Homo sapiens followed the same pattern as other African predators. "The only manner to test it is to find direct evidences of modern human eating marks on Neanderthal remains, such cut or broken marks on bones in ... artifacts made by modern humans," explained Martínez-Navarro. So far, the evidence is not quite there, explained paleo-ecologist J.R. Stewart of Bournemouth University in the U.K.
"This is interesting because in actual fact the Neanderthal remains with cut marks are generally found in deposits full of Neanderthal artifacts and not with human artifacts," Stewart said. "This suggests they were eaten by Neanderthals." That doesn't disprove the hypothesis either, it just means we'll have to see if any evidence is found to back it up. "The idea that humans hunted Neanderthals to extinction as part of the megafaunal extinction is new," said Stewart. "Not that humans killed them all in a 'genocide,' which has already been suggested." And although Stewart isn't considers the new hypothesis "unlikely," he agreed that all hypotheses "need to be voiced and considered."